This is a list of the National Register of Historic Places listings in Santa Clara County, California. This is intended to be a complete list of the properties and districts on the National Register of Historic Places in Santa Clara County, California, United States. Latitude and longitude coordinates are provided for many National Register properties and districts; these locations may be seen together in an online map. There are 114 properties and districts listed on the National Register in the county, including 6 National Historic Landmarks. Another property was once listed but has been removed. (#73000449) Generally bounded by the Alviso Marina County Park, Guadalupe River/Alviso Slough, Moffat St. and El Dorado St.
(#79000544) 11 E. Campbell Ave.
(#89001048) 1 W. Campbell Ave.
(#82002266) 233 W. Santa Clara St.
(#86000264) 325 S. First St.
(#90001813) 1102 E. Santa Clara St.
(#77000343) 160 N. 3rd St.
(#90000119) 140 University Ave. and 514 High St.
(#02000384) 66 S. 14th St.
(#80000857) 140 S. Peter Dr.
(#95000996) 9.5 miles (15.3 km) northeast of the junction of New Ave. and Roop Rd. (#04000863) Channing Ave., Ivy Ln., Greer Rd., Wildwood Ln. (#04000862) Nelson Dr., El Capitan Pl., Adobe Pl., Creekside Dr.
(#77000342) 12345 S. El Monte Ave.
(#80000864) 2295 S. Bascom Ave.
(#83001238) Roughly bounded by Julian, 1st, 7th, and Empire Sts. (#06000328) 211 SW First St.
(#80000865) 302 and 320 S. Market St.
(#82002271) 1219 Santa Clara St.
(#80000866) 60 N. Keeble Ave.
(#91001382) 1-24 N. Santa Cruz Ave., 9-15 University Ave. and 14-198 W. Main St.
(#06000659) 775 Santa Ynez St.
(#80000858) N. of Morgan Hill on Burnett Ave.
(#100002288) 721-781 N. Capitol Ave.
(#93000667) 160 N. Main St.
(#82000991) 227-247 N. 1st St.
(#100000836) 2020 East San Antonio St.
(#73000454) 184 W. St. John St.
(#79000545) Southwest of Cupertino at 13100 Montebello Rd. (#80000861) Roughly bounded by Embarcadero Rd., Addison Ave., Emerson and Cowper Sts. (#86000592) 518-581 Ramona St. and 255-267 Hamilton Ave.
(#78000778) 3070 N. Shoreline Blvd. (#82000992) 693 S. 2nd St.
(#79000546) Roughly bounded by N. 1st, N. 4th, E. St. James, and E. St. John Sts. (#77000345) Market and San Fernando Sts. (#14001113) 201 N. Market St.
(#83003822) E. Santa Clara, South First, Second, Third and E. San Fernando Sts. (#03000989) 210 S. First St.
(#78000781) South of San Jose at 15460 Union Ave.
(#74000559) 525 S. Winchester Blvd. (#78000773) South of Cupertino on Prospect Rd. (#75002133) Unknown 36 S. Market St.
San Jose Demolished January 12, 1976. 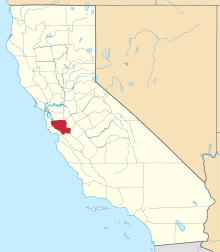 Wikimedia Commons has media related to National Register of Historic Places in Santa Clara County, California. ^ "California Historical Landmarks: Santa Clara". Office of Historic Preservation. Retrieved June 18, 2014. ^ "Summer Retreat to Hostel—100 Years and Still Standing" (PDF). Saratoga Historical Foundation Newsletter. Saratoga, California. May 2010. p. 5. Retrieved September 24, 2012. ^ Emmer, Jennifer (September 4, 2007). ""The Most Historic Building in San Jose" burns to the ground". Retrieved September 22, 2012. ^ Gilbert, Lauren Miranda; Johnson, Bob (2004). San Jose's Historic Downtown. Arcadia Publishing. p. 36. ISBN 0738529222. This page was last edited on 26 September 2018, at 20:58 (UTC).